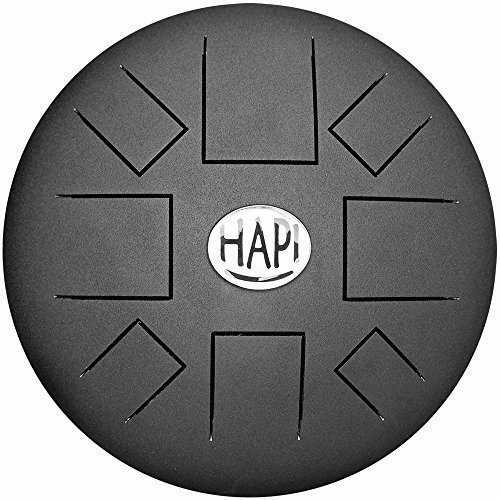 HAPI Slim Steel Tongue Drum. 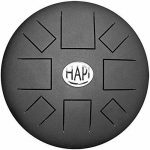 This drum uses our patented (D620,041S) eight note layout which adds harmonic tones to each note when played. A bottom port helps let the sound out to fill the room and rubber feet allow it to be set on any surface for play. 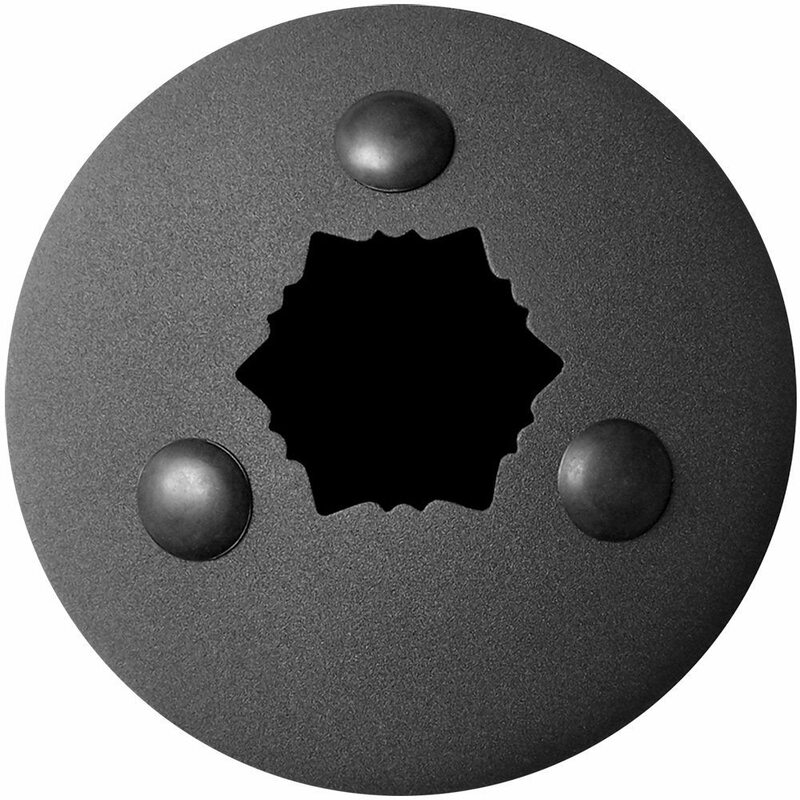 Attractive flat textured black powder coated finish inside and out. 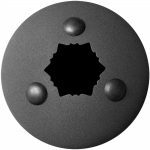 It is a durable protective layer for your drum that adds a cool “stone” finished texture. Scale: C Major Pentatonic. It ranges from C4 (middle C) to E5. C Major is a very popular musical scale. It has no flats or sharps. It is also known as a “natural” scale. 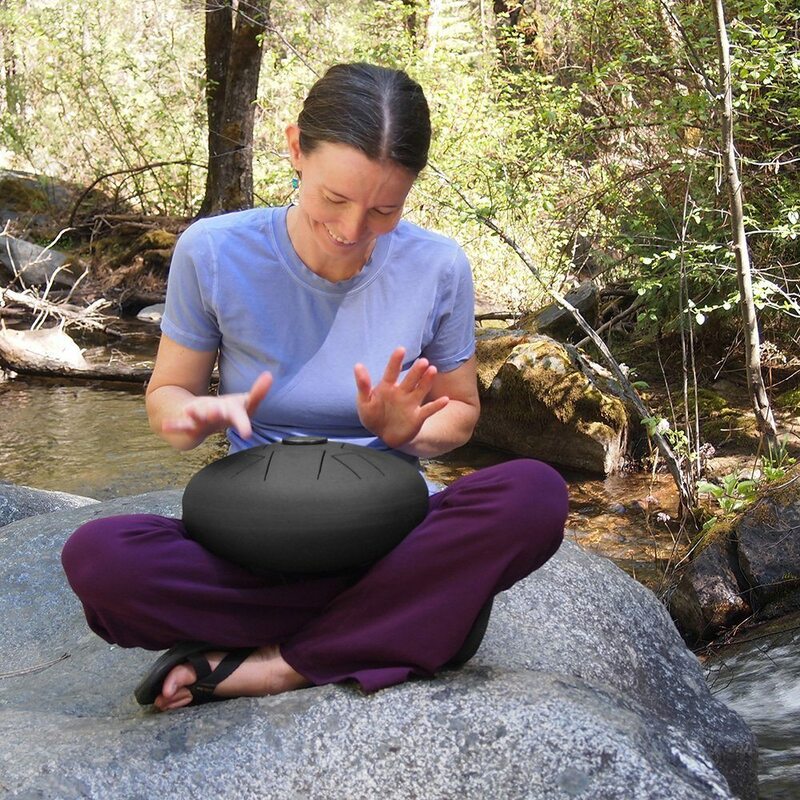 Anyone who wants an easy to play intuitive instrument can play this instrument. You don’t need a musical background to enjoy it. 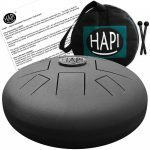 Ideal for jamming and playing percussive beats. The note layout makes it easy to jump right into grooving rhythms. Enjoy creating a soothing harmonic journey. Add a melodic component to your beats. An intuitive arrangement to the notes makes it easy to explore new musical horizons. The strong meditative tones are calming and great for relaxing anytime. 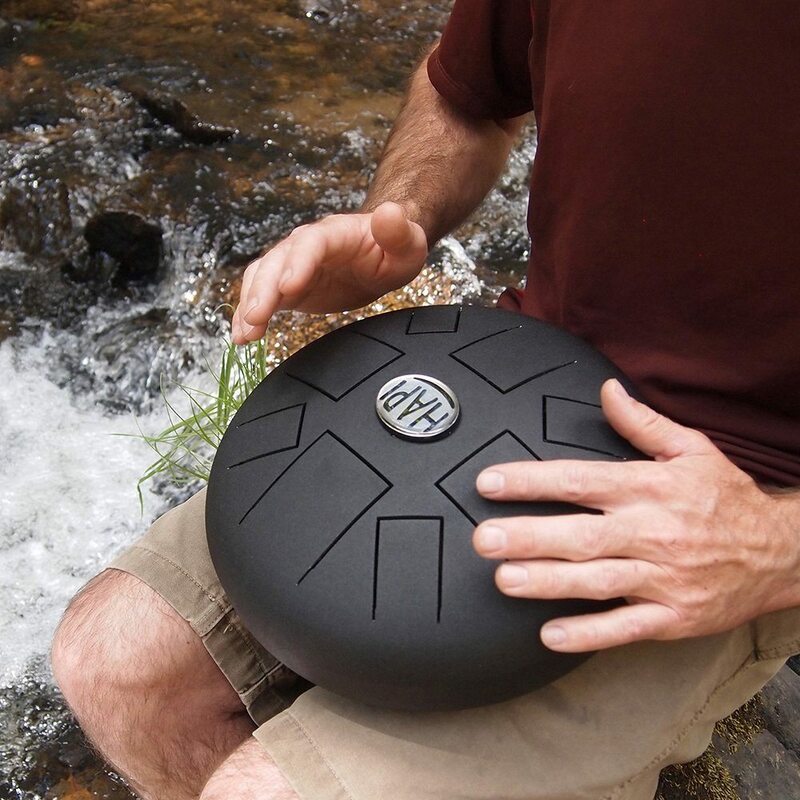 And because of its compact design you can take it outside to enjoy on a nature hike or sitting around the campfire in the evenings. 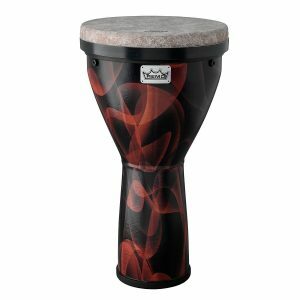 Comes with a pair of mallets that are specifically handmade for our drum. 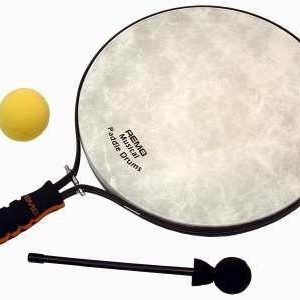 It also includes a handbook that outlines playing techniques and a FREE padded travel bag. The handbook has mallet and hand playing techniques, as well as practice exercises. Dimensions: 12″ wide by 6″ high. Weighs 7 lbs. Scale: C Major. Color: Black. 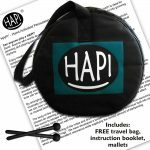 Includes: 1 HAPI Slim Drum, 1 pair of mallets, 1 instruction booklet. 1 FREE padded travel bag. C Major Pentatonic (C4, D4, E4, G4, A4, C5, D5, E5). Easy to play! You don’t need a musical background to enjoy this drum! 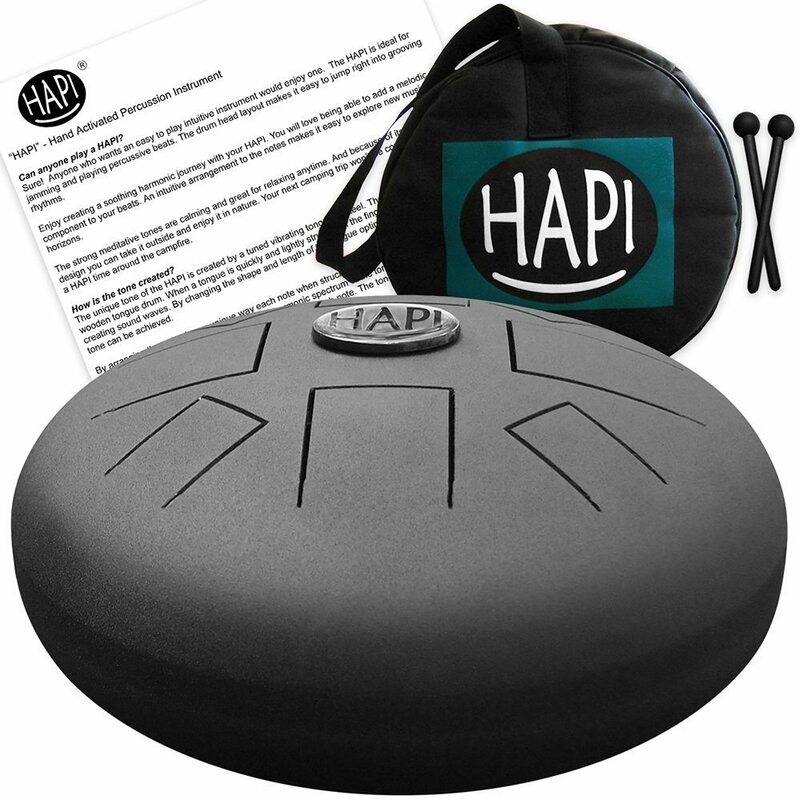 Includes: HAPI Slim Drum. Mallets. Instruction Booklet. FREE Travel Bag. Dimensions: 12″ wide by 6″ high. Weighs 7 lbs. Color: Black, durable protective stone texture.